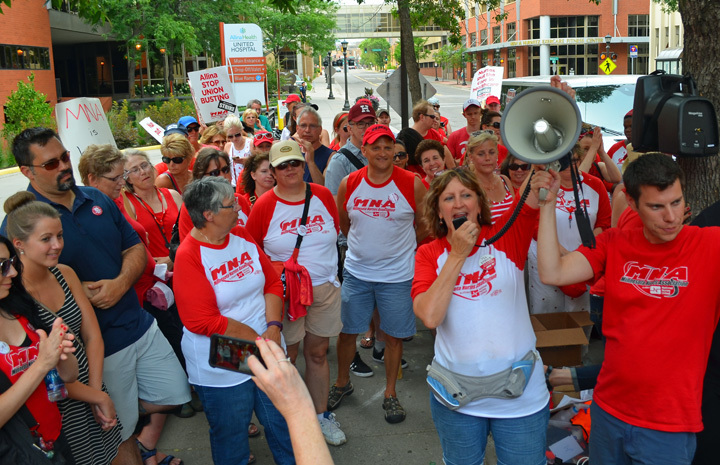 Nurses rallied outside United Hospital in St. Paul during a seven-day strike at Twin Cities Allina Health facilities in June. Allina nurses came to contract negotiations today ready to compromise. Unfortunately, Allina executives had a very different agenda. The two sides cut off talks today without making progress on a new contract covering about 4,800 members of the Minnesota Nurses Association who work at five Twin Cities facilities. Allina Health rejected nurses’ compromise offer that would phase out two of four health insurance plans sponsored by MNA. Since talks began in February, Allina has refused to compromise on its demand that all four plans be eliminated. Becchetti and other members of the nurses’ bargaining team said they would ask members to vote on Allina’s offer later this month. A vote to reject the offer is also a vote to authorize another strike, which would require a super-majority, according to the union. MNA says Allina has continually refused to provide critical data for negotiations, including information about the cost of health plans Allina is seeking to eliminate. The prompted MNA to file charges of unfair labor practices with the National Labor Relations Board, resulting in a seven-day strike in June. The negotiations cover nurses at Allina’s five metro facilities: Abbott Northwestern, Mercy, United and Unity hospitals, as well as Phillips Eye Institute. Know that the Retired nurses in the Bay Area have your backs! Anoka Hennepin Education Minnesota our local teachers Union of 3000 members supports nurses and their efforts to resolve this conflict.